Home / Community / May Luncheon Re-Cap. 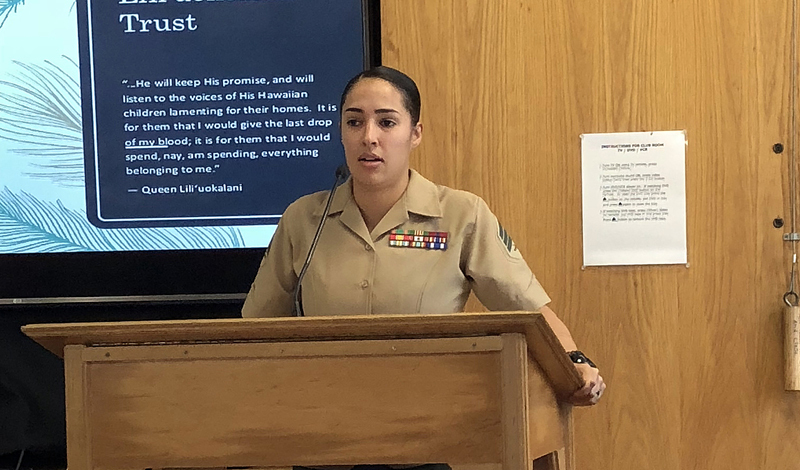 Sergeant Alexandria Aglio, Marine Corps Base Hawaii. Sergeant Aglio works as the Career Planner for headquarters battalion at Marine Corps Base Hawaii. She’s been with her current unit for about a year and a half, and with the Marine Corps for almost six years. She is from Menifee, California. Lance Corporal Abraham Palacios, Marine Corps Base Hawaii. Lance Corporal Palacios works in the Finance office of Marine Corps Base Hawaii as a Pay Clerk. Originally from El Paso, Texas, he’s been in the Marine Corps for nearly a year and a half. Our group was very interested by the informative speech and the following Q&A session by our latest speaker of the month of May. Thank you to Kainani Kahunanui, MSW – Direct Service Specialist, and Erika Gaspar, Office Manager, of the Liliuokalani Trust. In honor of Queen Lili’uokalani’s legacy, the Lili’uokalani Trust (LT) continues their commitment to improving the well being of orphan and destitute Hawaiian and local island children. In 2015, the LT Trustees broadened the organizational vision of LT to impact the children by focusing on breaking the cycle of poverty for the Hawaiian ‘ohana. The work with LT starts with and is always connected to the life and legacy of the Queen. LT provides a child-focused, family-centered, community-based approach to provide services along the micro, mezzo and macro continuum.